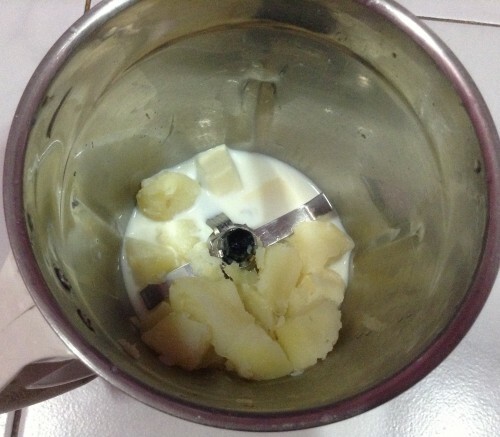 Today I bring to you a gooey recipe – potato cheese mash which is apt for weight gain in babies and kids. My father is an avid reader and loves agriculture. His love for soil, plants, herbs, garden kitchen, all could be seen at our home back Kerala. When we were coming back to Mumbai after my brother’s wedding, he was found reading a book in the train. I took the book when both he and Anshika slept at noon. It was a book on different vegetables and its medicinal values and usage in Ayurveda. I browsed through the pages and reached ‘potato’. It was written there that in olden days, people used to wash, clean, sun dry the sliced potatoes and then store in airtight containers. This powder was then combined with milk and sugar, made into a porridge and given to babies as solid foods; just like raw banana powder porridge. I was like ‘WOW, I didn’t know this‘. Back home I researched for that ancient recipe but couldn’t find any 🙁 But I saw many European countries have adopted it with the addition of cheese. Voila !! For me a new baby food recipe was born, its Potato Cheese Mash !! You can also read Chicken , Apple and Sweet Potato Mash recipe for babies and kids. Potatoes are rich in starch and carbohydrates, minerals and vitamins. Potato Cheese Mash is ideal for 8 month plus babies and kids. This is one of the foods which can help your baby to put on weight. Pressure cook a medium potato for 5-8 whistles or till its mashy in consistency. Once cooled down, add roasted cumin powder, cheese and blend / mash to a smooth consistency. Adding milk is optional. Read why cheese and butter can be introduced to babies below 1 year , but no cows milk. Do let me know how your baby /kid responded to this potato cheese mash recipe. Next Article 25 Frequently Asked Questions About Food for my Daughter’s Daycare – With Answers !! Hi, shall I give this in evening breakfast ? Amul cheese spread ,is it ok to give to 20 month baby. Pls let me know . Hi , thank you for the recipe. I wanted to check which cheese would be ideal to use for 9 months old baby? You can give it as lunch. I am giving her cheese for the first time….I used Britannia cream cheese and my 8 months baby girl not interested in this recipe much. I tasted the recipe and loved it 😉 Will she get used to it after some days?? And what to do with the leftover recipe?? Can I store it in refrigerator and feed it next day?? my son is 2 years and 8 months old,and weight is only 12.8 kg …Is it under weight ? Can you suggest some gud recipes for him bcs nw he s denying all the food ..
Hi Sangeeta! I like this recipe. Tell me one thing Is it safe during cough. Tarjeet, if the baby is having cough, it would be better to avoid it till he has recovered completely. Whats her birth weight? Whats her current weight? There is no need to be scared about adding cheese cubes as it gets melted completely 🙂 Yes you can use cheese slices too. I was adding little cows milk in porridges for my 9month old genius. But she was poopin green. After I stopped adding milk she was fine. Thanks to you. I generally gothrough many blogs n websites searching for recipes as I have a v v v fussy eating angel sanju : ) who soon turns one n half year …but never bothered to give a comment as am bit lazy, but in ur case, I simply couldn’t resist : ) posting ! Oh that’s great Sugi. Thanks for your kind words! I mAde this today and it was quite sticky. Ideally it shouldn’t be Meryl. Its of the flowing consistency. Make sure the potatoes are well boiled and cheese is blended well. Hi sangeeta….ur websteisvery ueful…i also has baby girl of 9.5 months worried about her grow as she had only 2.7kg by birth…has a t of 65cm…..proble is that i dont have breastmilk at all…o givig her pasteurised milk….canu suggest a diet toimproveher ht n wt….. Confused. We should avoid cow’s milk till they turn a year old. But cheese and ghee are fine? Which brand/variety are good? No need for any confusion. Let me explain in detail to you. You know why cows milk is not advised for babies less than 1 year old.Cos of casein the milk protein and lactose the sugar found in milk. They are hard to be digested by small baby’s tummy often causing lactose intolerance or diarrhoea. But during the clarification process of butter ie during the process of making ghee these milk solids are completely removed making it edible for babies less than 1 year old. Usually processed hard cheese are completely void of milk solids or lactose hence making it another edible dairy product for babies from 8th month. All processed cheese like amul,britannia etc are good. Cottage cheese or Paneer is also good. Home made ghee is the best for babies and kids. These processed cheese seem to be having salt content. So still thinking if its ok. I might start adding some ghee to her food though. Enoda ponu one and half yrs.but under wgt irka.nanum feed panitae irkan .but wgt increase agala.y.teeth inum varala.ena panalam.8kg tan iruka. Hi Anitha , Dont give cows milk untill 1. If you are using formula , then you can add the prepared formula to the blended boiled potatoes and cheese. You can also make it in plain water w/o any milk. Tastes yummy cos of the cheese in it .. This recipe seems really good. Thanks Sangeee….. Keep posting. Your recipes helped me a lot. But I want to tell u 1thing that my 13month old baby is unable to digest everything I feed her. She vomits. So, what can I feed her so that she will gain her weight and she won’t vomit also. If u suggest something it will be very helpful for me. Please give me a food chart so that I can follow that and feed my baby. Can we use amul cheese..? yes Shanya .. Amul cheese can be used ..
What kind of cheese do you give your 8 months old baby. i mash the potato and add butter, pepper and cumin powder to it.but wud like to try with cheese. Hi Praiselyn , welcome to Bumps n Baby and happy that you found the articles useful. You can try hard cheeses like cheddar, mozarella etc. I am so glad I found your website. My daughter is 9 1/2 months old and is not heavy enough for her age (as per her doc's growth chart, 6.8kg for a 9 1/2 month old baby is very low ). We've been asked to help her gain at least 1- 1 1/2 kg by the time she is 1 year old. This potato recipe seems perfect for that! Will make this for her dinner tonight. Just wanted to clarify, can I use whole cows milk for this recipe? You can use cows milk also .. But make sure its not added much..